Get higher grades in assignments and exams. Look no further. We have all the resources that you would ever need to write case study summary / analysis, MBA term papers and MBA research papers. Case study contains large number of pages. Not able to devote enough time from their busy schedule to solve a case study. Well whatever may be the case, our online library is equipped with all the arsenal you would ever need for your case study solutions/analysis. We also have a section for MBA Term Papers and Research Papers to cover the entire array of your MBA education. You will find it useful in all your MBA related studies be it case study, term papers, assignments, projects, research works etc. We have gone a step further to include streams like humanities, history, psychology, sociology etc. which revolve around the periphery of basic MBA domains like human resources, organizational behaviour, marketing, finance etc. 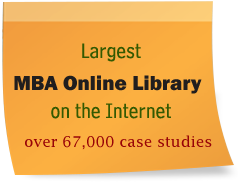 We have made an attempt to provide MBA students with the most comprehensive library on the internet.